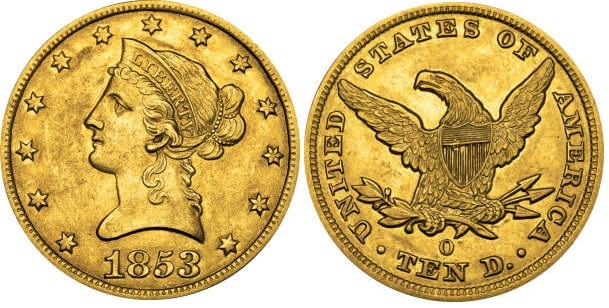 The Liberty Eagle ($10) gold series was introduced in 1838 and struck until 1907 (the half eagle would follow in 1839 and the quarter eagle in 1840). One of the longest continually running coin series of the United States, a basic date/mint mark set contains 179 coins, many of which are extremely difficult to find. Compared to the half eagle and quarter eagle sets, however, it is not as difficult, as there are no unique or nearly unique coins in the set. Despite this, only a few collectors have succeeded in putting a date/mint mark set together. In this article we will take a look at some of the toughest coins the specialist will encounter in their journey towards completion. After not having been struck for circulation since 1804, the ten dollar gold denomination was reintroduced in 1838. That year the Philadelphia Mint struck 7,200 pieces for circulation. Many consider this and a scarce variety of the next year a different type, as the obverse image of Liberty is distinctively different than the one found on later issues. Survivors are difficult to find in any grade and most are circulated, although a few Uncirculated pieces exist as well. The best of these are graded MS-63, and one of those in an NGC holder sold for $115,000 at auction back in 2007. The first Branch Mint issue of the denomination was struck at the New Orleans Mint in 1841-O, and is also one of the rarest coins of the series. Just 2,500 were originally struck and only a small number of these survive to this day. The issue is unknown in Uncirculated condition and pieces that exist in the upper ranges of About Uncirculated have their own problems. Striking quality was weak for this issue and all will show incomplete detail. Heavy marks and other visual impairments are also common, and finding an original 1841-O Eagle is not easy at all. Pieces are always in demand and the coin is especially popular with New Orleans specialists, as it was the first coin of this denomination struck at that Mint. The 1859-O is the rarest coin of this denomination struck at the New Orleans Mint. With a mintage of 2,300 coins, it has only the second-lowest mintage of Eagles struck at the New Orleans Mint. The 1883-O had a lower mintage, but attrition was very high for the 1859-O. Approximately 50 to 60 coins are known to exist in all grades. All pieces known are circulated and even AU pieces are rare. Like other New Orleans issues, all are weakly struck in as much that the stars will show virtually no detail even on the highest graded pieces. One of the finest-known pieces has a pedigree dating back to the early 20th century and belonged to the famous Clapp and Eliasberg collections. It has been graded AU-55 by PCGS and sold for $52,900 back in 2006. The 1860-S is the rarest San Francisco Gold Eagle and a very underrated issue. It lacks the appeal that some of the early S Mint issues have (the California Gold Rush was largely over by the time this coin was struck), and for many years it has been somewhat of a sleeper within the series. Only 5,000 pieces were struck and all of these were quietly released into circulation, with approximately four dozen known today. Until the S.S. Republic was found and two Uncirculated pieces were brought back to the surface, this issue was unknown in Uncirculated condition, and today even AU’s remain major rarity. The single finest-known example is graded by NGC as an MS-62 and comes from the S.S. Republic. Demand for gold coins on the East Coast was extremely low during the American Civil War and mintages plummeted, especially so for the ten dollar denomination. During the height of the war, in 1863, the Philadelphia Mint only produced 1,218 business strikes and 30 Proofs for collectors. Today, this is one of the rarest Gold Eagles from the Philadelphia Mint. In fact, about as many Proofs are offered every decade as there are business strikes. Only two Uncirculated coins are known to exist; one in the Bass collection and another that emerged from the wreck of the S.S. Republic. Most pieces are well circulated and even AU’s are very rare. The 1870-CC was the first ten dollar gold piece struck at the Carson City Mint and the rarest of all Eagles struck at the Nevada Mint. While its mintage of 5,908 was not the lowest, all pieces entered circulation and were later lost or melted. Because of this, there are perhaps three dozen survivors of this date — all circulated since this date is unknown to exist in Uncirculated condition. Virtually all that do survive have been impaired by heavy marks and/or cleaning, and there are no true problem-free pieces known to exist. This is something that is taken into consideration by the grading services, as they often appear more lenient for this date than they would be with a 1904 Eagle, for example. One of the finest-known pieces has been graded AU-55 by PCGS and sold for $115,000 in 2006. The 1875 ten dollar gold piece has the lowest mintage of the denomination, with only 100 business strikes and an additional 20 Proofs minted for collectors. With such a low mintage it should not come as a surprise that this is one of the rarest of all American gold coins, and it shares this story with some of the other gold denominations of that year. In fact, it has the lowest mintage of all regularly produced United States gold coins. All known examples are circulated and lack eye-appeal; it is estimated that less than a dozen circulation strikes now exist. This makes it the true key-date of the series, and a coin that is encountered infrequently in any grade. Most offerings will be Proofs, despite having a much lower mintage. True circulation strikes that are offered will be recognizable by a different date position than the Proofs, but the grading services have made the mistake of certifying impaired Proofs as circulation strikes — something to keep in mind when you’re in the market for one of the few 1875 business strike Eagles in existence. Of the nineteen different Carson City ten dollar gold pieces, the 1879-CC has the lowest mintage. As the Mint was busy concentrating on producing huge quantities of silver dollars, mintages of the other denominations dropped considerably, and only 1,762 pieces were produced that year. Approximately 50 pieces are known to exist to this day. Virtually all of these are in the XF range and true AU coins are rare. A single Uncirculated coin has been graded: an NGC MS-62. Despite the lower mintage it is not as rare as the 1870-CC, but it is not a common date either. While the 1859-O Eagle is considered the rarest of all New Orleans Eagles, it does not have the lowest mintage. That honor goes to the 1883-O, of which just 800 were struck. Numismatists of the time, however, appear to have taken a bit of notice, and today approximately four dozen are known to exist, of which only a few are true Uncirculated examples. The low mintage has recently been noted by collectors and this date is more popular than it was twenty years ago. Any offering of an 1883-O Eagle is a rare occurrence, and when they do come up for sale they tend to be heavily marked or otherwise impaired. As with other New Orleans coins, they tend to come weakly struck, especially on the obverse. An NGC AU-53 sold for $67,333 in 2011, but none of the higher-graded examples have been offered at public auction since the late 1990’s. Obviously, with such a long series there are plenty of other rare and scarce dates. Mintages of many dates are below 10,000 coins, and others circulated so extensively that few to no Uncirculated coins have survived. As these are heavy gold (a soft metal) coins, many circulated pieces show heavy abrasions. This is especially true for dates in the 1840s and 1850s. Despite this, these coins have always been popular, due in part to the fact that they were the largest denomination struck by the United States Mint prior to 1850. While a complete set is certainly a challenge to collect, some people have managed to do so successfully.